BEHOLD, SOME ARE LAST WHO WILL BE FIRST. This Sunday's scripture readings paint a picture of salvation where God's mercy and the invitation to salvation is extended to "all your brothers and sisters from all the nations" (Gentiles). Our first reading (Isaiah: 66-18-21)was a lesson to the Jews returning from exile in Babylon that God's mercy and salvation will reach the ends of the earth. "Thus says the LORD: I know their works and their thoughts, and I come to gather nations of every language; they shall come and see my glory. I will set a sign among them; from them I will send fugitives to the nations: to Tarshish, Put and Lud, Mosoch, Tubal and Javan, to the distant coastlands that have never heard of my fame, or seen my glory; and they shall proclaim my glory among the nations. They shall bring all your brothers and sisters from all the nations as an offering to the LORD, on horses and in chariots, in carts, upon mules and dromedaries, to Jerusalem, my holy mountain, says the LORD, just as the Israelites bring their offering to the house of the LORD in clean vessels. Some of these I will take as priests and Levites, says the LORD." In our Gospel reading (Luke 13:22-30), Jesus taught a stern message to his followers - those who do not accept God's mercy will, by their own actions, be denied entry into the Kingdom, while those from afar who do accept it will be welcomed to the table of the Master. "Then he will say to you, 'I do not know where you are from. Depart from me, all you evildoers!' And there will be wailing and grinding of teeth when you see Abraham, Isaac, and Jacob and all the prophets in the kingdom of God and you yourselves cast out. And people will come from the east and the west and from the north and the south and will recline at table in the kingdom of God. For behold, some are last who will be first, and some are first who will be last.'" Our Epistle reading (Letter to the Hebrews 17:5-7, 11-13) offers encouragement and strength to those suffering the "discipline" of the trials of discipleship. "Brothers and sisters, You have forgotten the exhortation addressed to you as children: 'My son, do not disdain the discipline of the Lord or lose heart when reproved by him; for whom the Lord loves, he disciplines; he scourges every son he acknowledges.' Endure your trials as 'discipline'; God treats you as sons. For what 'son' is there whom his father does not discipline? At the time, all discipline seems a cause not for joy but for pain, yet later it brings the peaceful fruit of righteousness to those who are trained by it. So strengthen your drooping hands and your weak knees. Make straight paths for your feet, that what is lame may not be disjointed but healed." 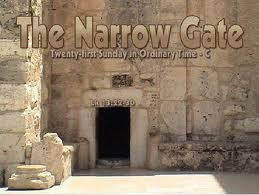 The gate is narrow, the road is hard; the rewards are beyond comprehension.